It may be midnight here in the UK, but this game is so nice to play and to listen to that I just had to give it a special mention on Indie Retro News. 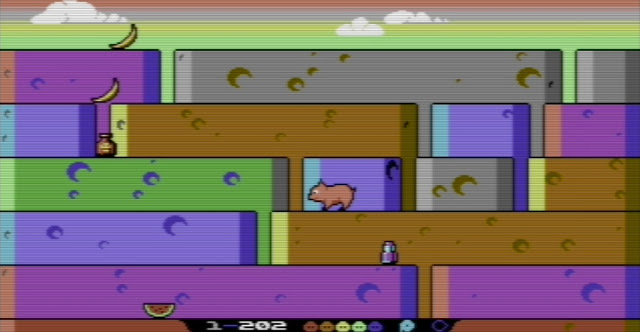 A game that has a cute pig, lots of fast moving fruit and it's all so colourful you'd be silly not to load up your C64 just to play it. This is ' QUOD INIT EXIT V1.05 ' by Retream; an Arcade homebrew which was made available for download this weekend! In this game which features a cheerful soundtrack by Richard and lovely graphics by Saimo, you play as a cute little pig that has to hop around the scene collecting fruit to fill up the colours at the bottom of the screen. When this is complete, you have to jump on the toilet, take a seat and let it take you away to the next level. Be warned though, that the fruit moves very quickly and if you're not careful you will touch the poison and you may just die if you don't eat again. This in truth is one of the nicest C64 games I've played all week, and I'm pretty sure you'll agree with me on that! So download it today, and have fun!